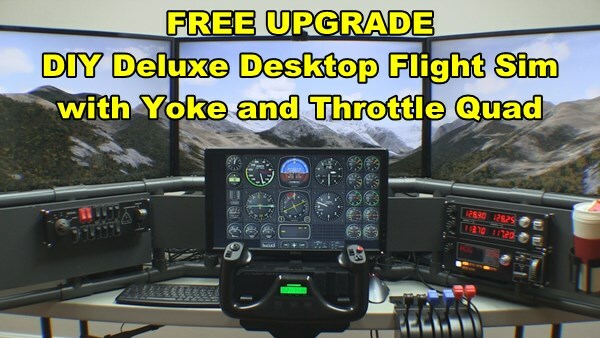 The DIY Deluxe Desktop home flight simulator plans are designed around three 32” HDTVs used as the main displays. But what if you want to use displays that are larger (or smaller)? Many DIY Flight Sim builders modify the plans to match their unique requirements. Furthermore, PVC pipe is a great material for experimental trial-and-error. It’s no wonder so many builders modify their projects. Gary is a DIY Flight Sim builder. He developed a useful spreadsheet to use when using larger (or smaller) displays with the DIY Deluxe Desktop home flight simulator plans. He was kind enough to share it with me, so I’m providing it to you in the course content. First of all, Gary’s spreadsheet is really clever. You simply enter in the dimension of the displays you want to use and then spreadsheet calculates how much to change the affected PVC pipes. Also the relevant pipes are identified in a new Pipe Frame Map. You still may require a little trial-and-error because different PVC manufacturers make the fittings differently. Fortunately, PVC pipe is inexpensive and easy to work with. 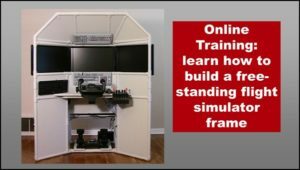 If you are enrolled in the DIY Deluxe Desktop Flight Sim course, you can download Gary’s spreadsheet here. 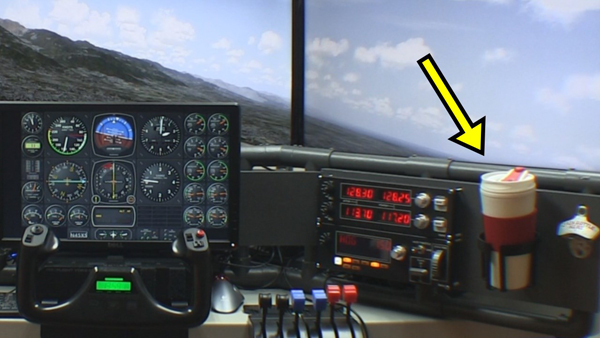 If you want to read more about modifying the DIY Flight Sim projects, see the section on Prototyping in the Builder Academy. 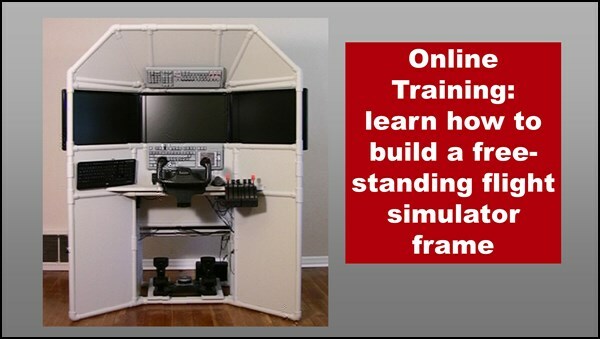 You’re looking for a home flight simulator for sale and you come across two similar DIY projects. How do you tell the two apart? 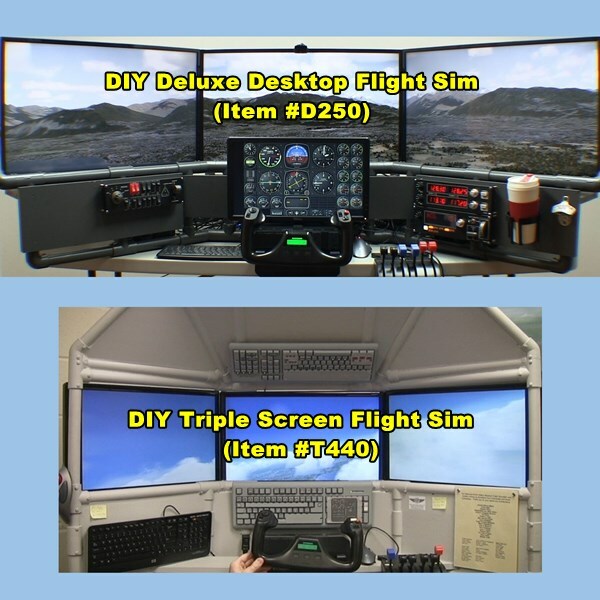 The DIY Deluxe Desktop Flight Sim and the DIY Triple Screen Flight Sim are similar, but there are some significant differences too. 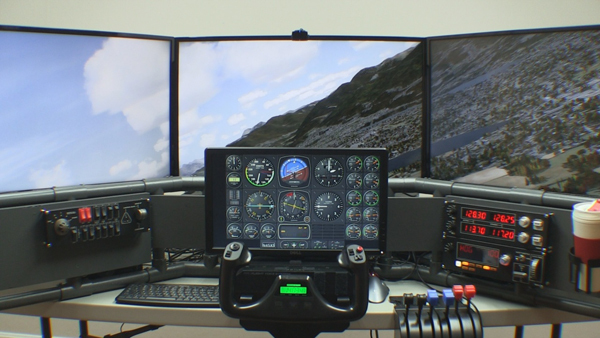 Here are 7 ways to choose the best multi-screen DIY Flight Sim for you. Note: for brevity, you’ll see me refer to the projects by their item numbers. The D250 Deluxe is much more adaptable than the T440 Triple Screen. 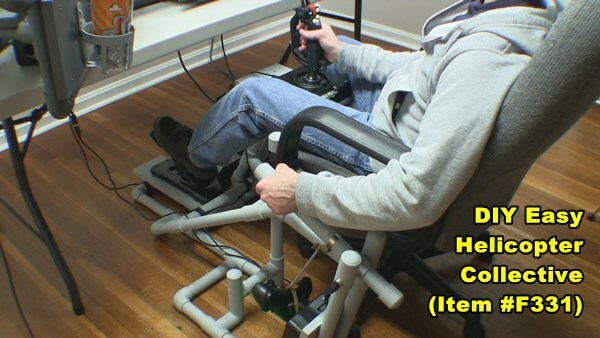 D250: You can build the D250 with a yoke and throttle quadrant, or pair it with one of the DIY floor frames so you can use HOTAS style controls or even a helicopter collective. Match the D250 with the #F311 Side Joystick Frame, the #F321 Center Joystick Frame, or the #F331 Easy Helicopter Collective. T440: On the other hand, the T440 is great with a yoke and throttle quadrant as originally designed. But if you want a joystick and side throttle, you would need to invent some modifications. The D250 instructional video is much newer than the T440. T440: I produced the T440 video in 2011 as a part of a successful Kickstarter campaign. I had a very short amount of time to design and build the project and a short time to film, edit, and publish the video. It’s still a great project though. D250: I produced the D250 video in 2016 so it has better lighting, better sound, I used a better camera, and I had more experience editing than I did in 2011. The D250 has larger screens. D250: I used 32” HDTVs for the three main displays. The combined screen width is over 6 feet wide. T440: I used 24” monitors for the three main displays. The combined screen width is less than the D250, but still impressive. The T440 was designed to have an overhead panel like an airliner. For this reason, the T440 Triple Screen bundle includes the DIY Airliner Keyboard Modification. The D250 doesn’t have a place for an overhead panel. The T440 has Styrofoam, the D250 does not. Builders use ½” styrofoam sheets when constructing the T440 Triple Screen project. Styrofoam may be cheap or expensive depending on where you live in the world. 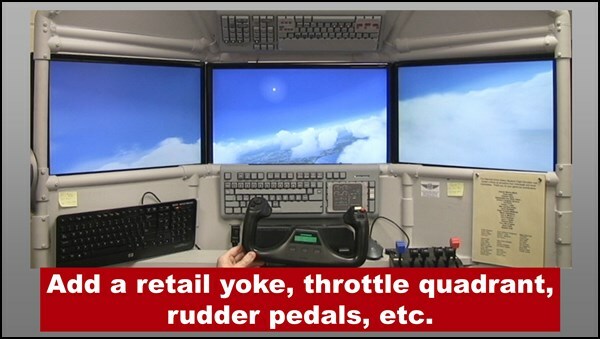 T440: You will see several builders in the Customer Gallery added a 4th monitor to display the flight instruments. I didn’t include anything about that in the instructions, those clever builders modified their projects on their own. 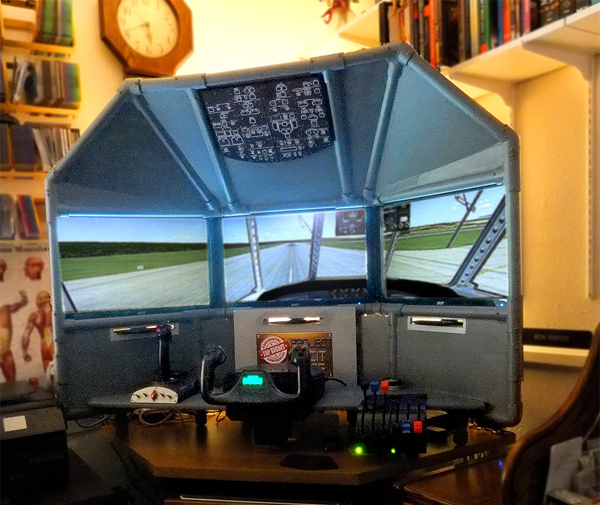 D250: I included instructions to add an optional 4th monitor for the flight instruments. I think the D250 is easier to build than the T440. D250: The project doesn’t require gluing any Styrofoam panels in place. But the D250 does include 1×8 boards. If your saw won’t cut 1×8 boards, you’ll need to get that done at the store when you buy them. T440: The project doesn’t require you to cut any lumber wider than a 1×6. You do cut Styrofoam with a utility knife, but it is not difficult just a little time-consuming. 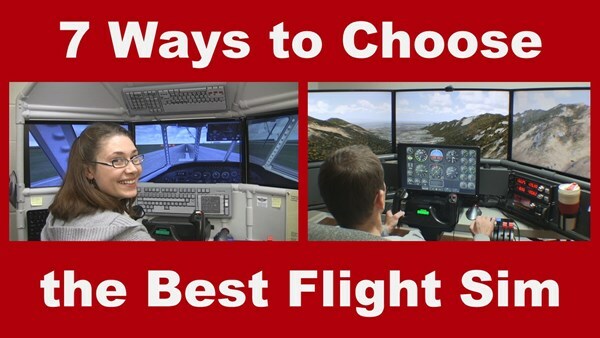 You have a lot of choices when it comes to your home flight sim project. I hope this comparison helps you. 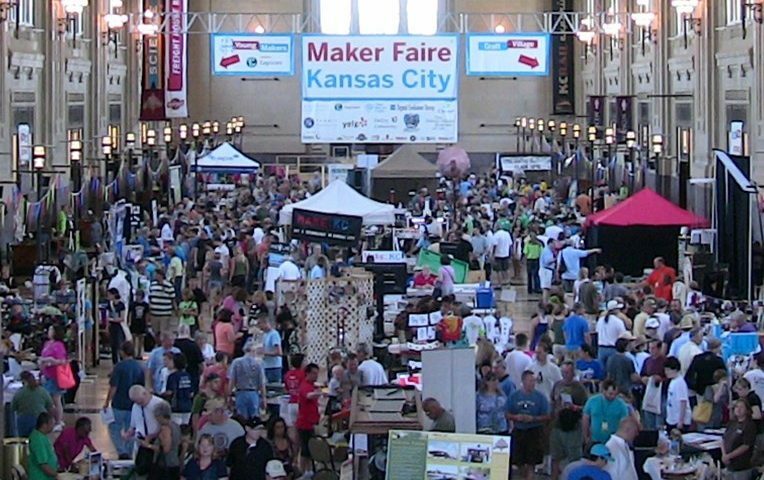 A Maker Faire is a festival of invention and creativity. In the words of Make Magazine it is, “an all-ages gathering of tech enthusiasts, crafters, educators, tinkerers, engineers, science clubs…” You would totally expect to find a DIY Flight Simulator at Maker Faire. We didn’t just bring one, we’ve brought four flight sims to Maker Faire so far. I say “we” because several friends helped me. There’s no way I could have done this alone. 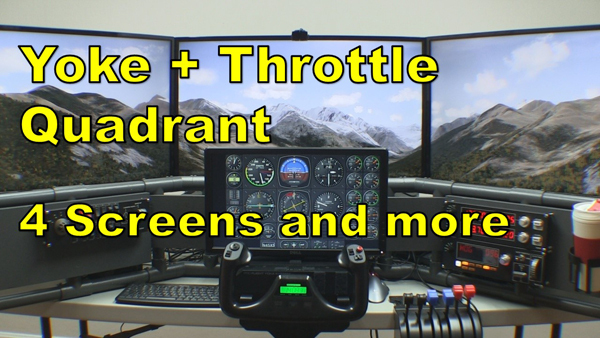 I funded the development of the T440 Triple Screen Flight Sim with a successful Kickstarter Campaign and I barely finished it in time for Maker Faire. 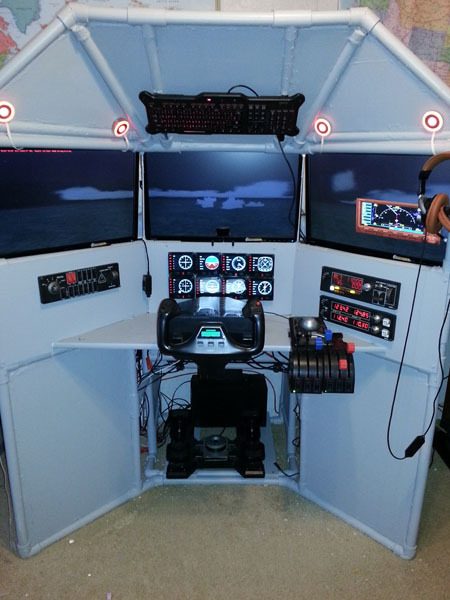 Transporting a flight sim of this size was a terrible logistical challenge, but we did it. The T440 worked perfectly and it was a huge thrill for me to see a crowd of people around the simulator all weekend. So many people, young and old got to try it out. Immediately after Maker Faire, we loaded the T440 into a Uhaul truck and took it to the National Airline History Museum, where it still operates today as a hands-on attraction for the museum guests. I created a complete instruction manual and video for this project so you can build one for yourself. This is one of my most popular products. My goal was to deploy a flight simulator at Maker Faire and I did it, but it was way too difficult to transport for just a weekend event. 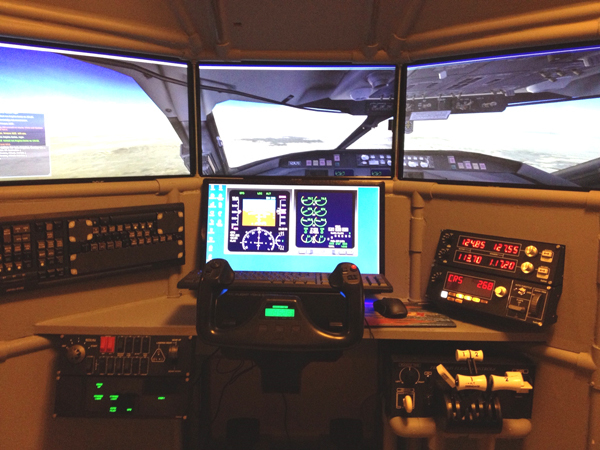 This experience at inspired me to develop a much more mobile flight simulator. 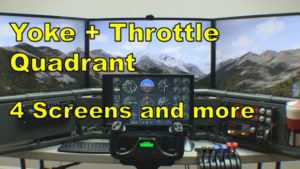 DIY Roll-Away Flight Sim: Three Versions! 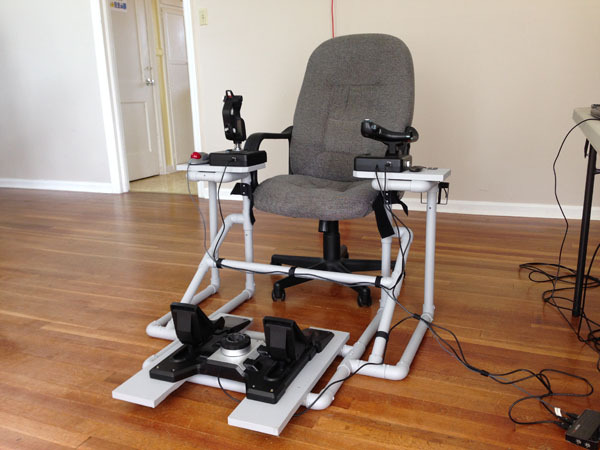 Problem: it was too difficult to transport a flight simulator at Maker Faire. Solution: I developed a much more mobile flight simulator that could be moved as a single unit… on wheels! 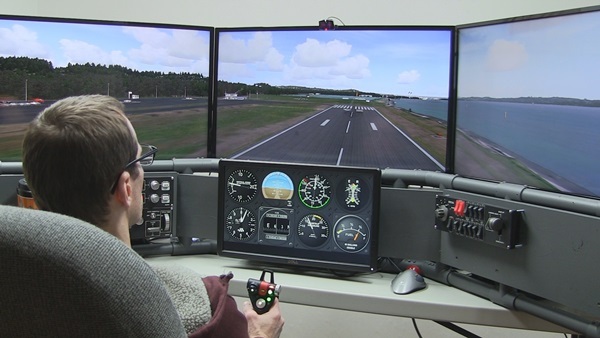 A Roll-Away Flight Simulator! 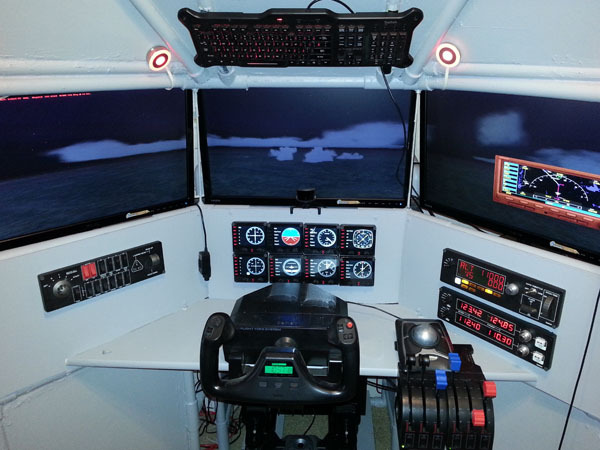 The first version of the E420 Roll-Away was basically a HOTAS set up to fly a jet fighter. The kids at Maker Faire loved it and is was super easy to transport. I was so pleased with this that I brought two Roll-Away Flight Sims to the next Maker Faire. The second version had a yoke and throttle quadrant and later became the E430C. 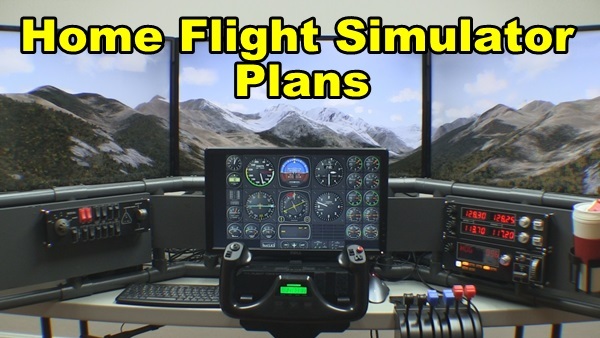 You can build either of these two types of Roll-Away Flight Sims with the instruction manuals and videos I created for you. The third version of the Roll-Away Flight Sim was a specialized type I created for kids at a science camp. I later brought it to Maker Faire. This version had no flight controls, only buttons to control a simulated spaceship. We used Martin Schweiger’s Orbiter as the demonstration software. The simulator is very realistic and teaches you a lot about Newtonian physics when controlling a spaceship in zero gravity. Notice there are several people in these pictures that are not me. I could not have done this alone. 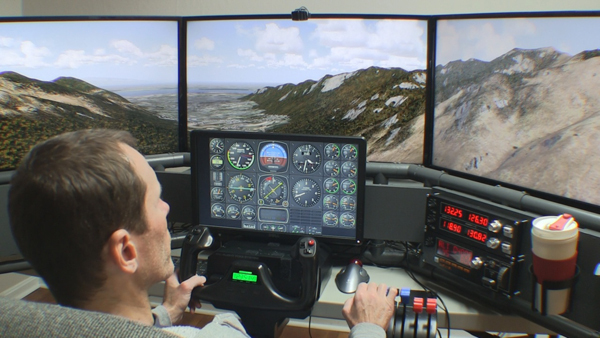 We helped hundreds of people try out these flight simulators, and had a lot of fun while we were at it. Many thanks to Aaron, Nick, Jim, Lindsy, Julie, Joe, Jason, Shannon, Michael, and Jennifer! One of the common questions I get is about altering the DIY Flight Sim designs. Most builders modify the designs in some way to match their specific needs or equipment. For examples, take a look at Customer Gallery 1 and Customer Gallery 2 and notice how no two Simpits are alike. 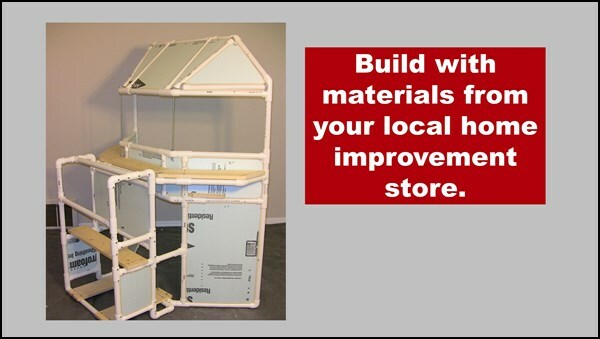 Once a builder deviates from the plans, the project becomes a prototype DIY simpit. There is no way I can predict how people will modify my DIY Flight Sim projects, so that is why I use building materials that are inexpensive and easy to use. Don’t be scared! Prototyping is a wonderfully creative process that can give you real satisfaction with your project. 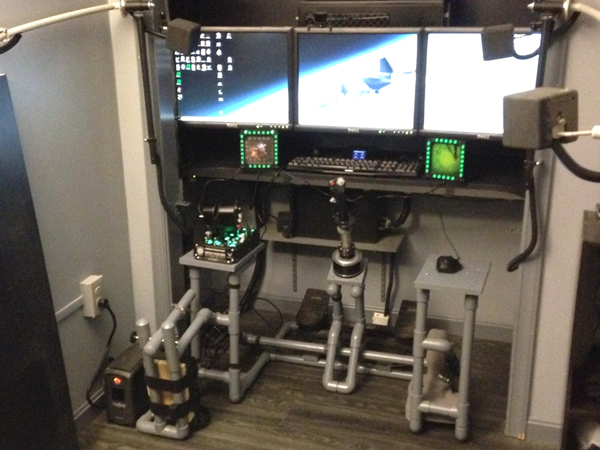 You don’t really know if a flight sim design is going to work until you build it in real life. Really! If some anonymous person on a forum says an idea will work or not work, they don’t really know, because anyone can type words on a screen. You only gain true knowledge by building a DIY simpit in real life. That is prototyping. I don’t know if my understanding of their message matches what they’re imagining. I don’t know if a proposed modification will require an additional structural reinforcement. I don’t know someone’s skill level. Have they built things before, or is this the first time? I don’t know if they have adequate tools. Are they building in a workshop or a dorm room, etc? Prototyping means you try your idea, then adjust it and try it again, then adjust it and try it again, and keep at it until you are happy with your work. 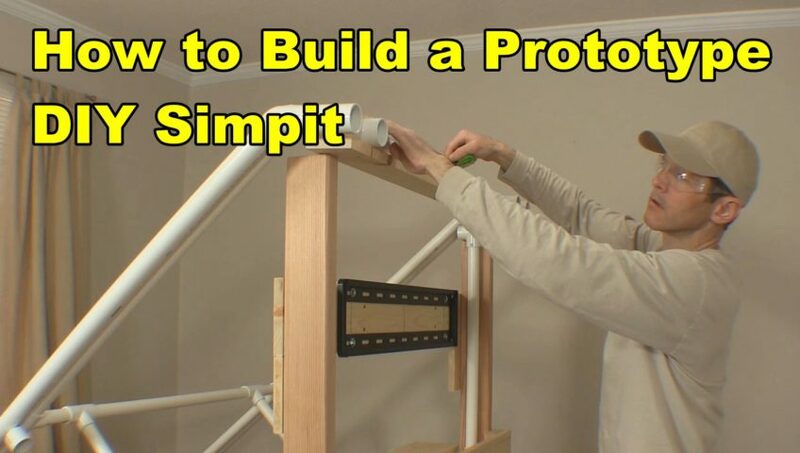 Fortunately, PVC pipe is a wonderful material for prototyping a DIY simpit (more about that below). When I am designing large DIY simpit projects I make a scale model of my idea. As a result, this helps me find any major flaws and get a feeling for what it will look like before I build it full size. 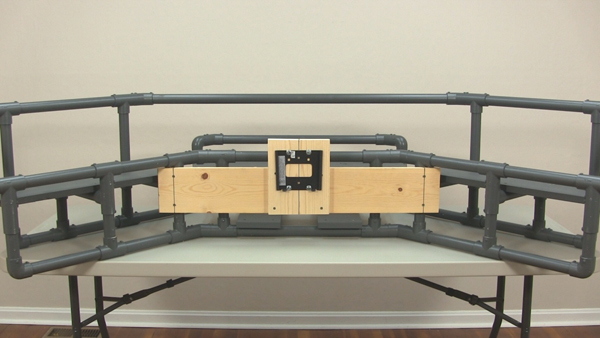 I use 1/2″ PVC pipe when I build a scale model. The smaller pipe saves me money because I use less 1″ pipe when I later build the full size prototype. I also make scaled down controls, displays, and switch panels. This isn’t Computer Aided Design, but I still call it CAD: Cardboard Aided Design. So how do you modify a DIY Flight Sim project if you need to scale it up or scale it down? Here’s an example. 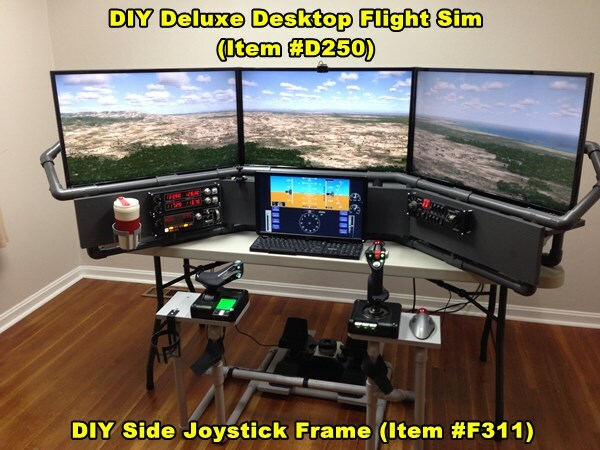 Let’s say you want to build the D250 Deluxe Desktop Flight Sim. 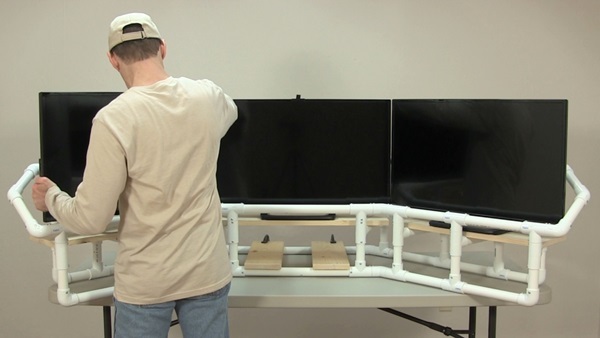 However, the project is built around 32″ HDTVs but you want to use 27″ monitors. How do you scale this down? Decrease the measurements of pipes by that same percentage. Only scale the pipes adjacent to the displays, for now. Cut the pipes and assemble them with the PVC fittings. Start with just the pipes adjacent to the displays. Observe if the frame fits well compared to the displays or if you need to make changes. If some pipes are a little too long, remove them and cut them shorter. If some pipes are too short, that’s why you bought extra pipe. 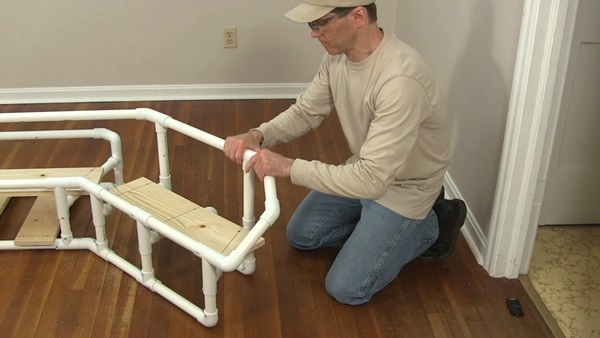 It’s easy to assemble/disassemble the PVC pipe frame to test different frame dimensions. Once you have pipe lengths that you are happy with, secure the PVC fittings with self-drilling screws. Scale the rest of the pipes to fit with the part of the frame you changed. This is much easier now that you have a starting point.